By the time the Americans began their aerial bombardment of Japan in 1944, both the JAAF and IJNAF were spent forces. What the Japanese did have though was the Ki-44 "e;Tojo"e;. Armed with two 40 mm cannon, it was the most heavily armed and feared single-seat fighter to see action against the new American bomber, the B-29 Superfortress. For the bomber crews, they had what they believed was… their 'ace in hole': a fully armed B-29 carried four remotely operated gun turrets and a tail gunner's position, making it the world's most advanced self-defending bomber.In every respect the Ki-44 pilots were fighting a desperate battle. Many who made their mark did so using suicidal ramming attacks or "e;taiatari"e;. 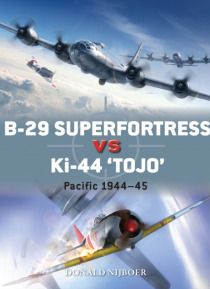 Illustrated with full colour artwork, this volume examines why the Ki-44 was unable to break up bomber formations conventionally during the Pacific War, and how its ramming tactics, while terrifying, graphically revealed Japan's inability to stop the B-29.